I am not afraid to admit that I am a chicken wing fiend. The opening of Buffalo Wild Wings throughout NJ not only changed my diet, it changed my life. I might be the only person who can say with a straight face that they go to Hooters for the food. In my journey to chicken wing Valhalla I have learned the wisdom of the ages, such as the fact that one must never trust a pizza joint to serve a proper wing, and that the proper ratio of meat : work to remove meat from bone yields the simple mathematical truth: wing > drumstick. Tomorrow is the Super Bowl, and as the chicken wing king of the calendar, it marks my favorite foodie holiday. I put it right there alongside Thanksgiving. After many years in pursuit of the perfect wing, it became clear that in order to achieve chicken nirvana, I must take matters into my own hands. Below is my wing recipe. Further below, some thoughts on the rest of the spread and suggested wine pairings, This is an #njwine blog, so you knew that was coming! The first step is making the marinade. Start with ¼ cup of butter. and melt it in a skillet. Mince 3 cloves of fresh garlic, and sautee in the butter. Once browned, add a cup of Frank’s red hot sauce, a cup of red wine vinegar, and a cup of full bodied red wine. Don’t use NJ wine, never cook with the good stuff. bring this to a simmer, stirring occasionally. Add 3 tablespoons of worcestershire, 3 tables spoons of onion powder, a ½ cup of Tabasco hot sauce. Add 2 tablespoons of red pepper flakes and 1 tablespoon of cracked black pepper. Keep stirring. Toss in a few dashes of tumeric. Remove from the heat and stir until it isn’t steaming. Put one pound of plain chicken wings into each of two freezer bags. Split the marinade into the two bags, seal, and refrigerator for 12 hours. Got that? You want to make these before going to Church if you want them to be the rock star of the spread during the game. Cooking- Preheat the over to 300F. 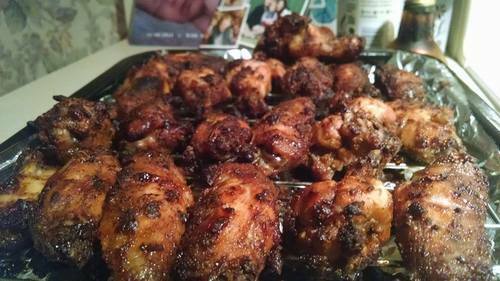 Once its there, put the wings on a rack over a cookie sheet. This is key, because we are rendering the fat off these wings. Since we are baking, not frying, we need air on all sides of the wing to get them crispy. We don’t want them cooking in the juices, we want the fat to drip off. After an hour in the over, turn them over with tongs. You might want to reapply the marinade if you some left. This will be the last chance to do that, afterwards you are risking contamination from the raw meat. Now, the other important part! What are we drinking for the big game?The Super Bowl was thought to be a “beer only” holiday, but any time there is food on the table, wine belongs. Fried chicken and Champagne is a classic combo, but since we have heat on these wings, the food calls for a wine with some sweetness. Beneduce Vineyards’s Gewurztraminer is the Pro Bowler here. Floral and fresh, with enough acidity to cut through the fat and just enough sweetness (0.6%rs) to take the edge off the heat, you’ll find yourself absentmindedly switching from wing to wine while wondering why you picked “over” on the length of the National Anthem prop bet. If you’ve never had Gewurz, you are missing out. Fans of Pinot Grigio and Riesling should put this grape, originally from Alsace in France on their “must try” list. Chili is on the menu. Rich, hearty, belly filling chili! With melted cheddar or gruyere, and cornbread on the side! This calls for a medium to full bodied red that has the structure to keep a firm mouth feel when sipped between bites of the hearty chili, but enough fruit and acidity to stack up against the heat and rich tomato base of the chili. Enter: Cabernet Franc. Sharrott Winery cool ferments their Franc, maintaining the fresh red fruit character. Maybe you’re spending Sunday on the slopes, enjoying cold powder, and won’t have time to cook? The Super Bowl is one of the five days of most pizzas sold in America. Just because you’re doing take out doesn’t mean we can’t pair well. A fantastic slice of Jersey pizza pie calls for a high acid, bold red. The Italians do it right when they call on the Tuscan reds based in Sangiovese. Auburn Road Vineyards’ “Classico” tips their cap to Chianti with this Sangiovese-based red blend. It just scored 89 points, highly recommended from the Beverage Tasting Institute. Nachos, chips, and guacamole- what you ask the guests to bring. Give a little thought to jazzing up the nachos, think of those crunchy corn tortillas as a blank canvas that you can do your best MasterChef impression with. Whether drizzling cheese or dipping into the fatty avocado guacamole, there’s just one cold white wine to turn to. 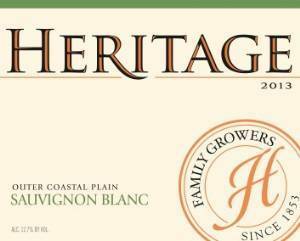 Sauvignon Blanc, like the one from Heritage Vineyards, is fresh, grassy, and high in acid- the perfect partner for the snacks and appetizers. Alright, there’s only one thing left to do. Hike the ball and let’s eat!